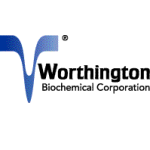 Worthington Biochemical is a primary manufacturer of biochemicals and enzymes, such as collagenase, trypsin, papain, elastase, and deoxyribonuclease I. The most fundamental consideration is that anything which is detrimental to the life of the cells with which we are working is also bad for the product we are trying to extract from those cells. Many isolation procedures we use rely on techniques which alter the solubility of proteins. Differences in solubility among different proteins makes it possible to separate proteins from one another through centrifugation and filtering: a method known as fractionating. Some of these procedures rely heavily on adjusting salt concentrations as a way of changing protein solubility without damaging the molecules; consequently, most of the waste generated consists of meat scraps, cell debris, fats, and various non-toxic salts such as sodium chloride and ammonium sulfate. The toxic compounds often associated with the chemical industry are precisely those substances we must avoid like lead, mercury, and many of the organic compounds used for plastics and petroleum products. There are several solvents we do use for defatting and for breaking open certain kinds of cells. When we use any of these solvents, we return all of the spent solvent to its original container. A container of used solvent is labeled, sealed, and stored in an isolated area for a maximum of 90 days. Worthington has its waste removed by a licensed waste removal company, and a complete paper trail is maintained so that every batch of every chemical can be traced from its manufacturer to it final disposal site. All of the Worthington products are materials extracted from living cells. As such they are all non-toxic. In fact they are just like any of the proteins you consume whenever you eat meat or vegetables.